I knew it was coming, but I didn’t think it would be so soon. Just three weeks after Brett Favre said no to Minnesota Vikings coach Brad Childress, he changed his mind and signed a 2-year, $25-million contract with the Vikings on Tuesday. Favre even practiced for the first time and plans to play in the teams preseason game on Friday. The news hit about mid-morning on Tuesday and it spread throughout the sportsworld like a wild fire. Most of the Green Bay Packers players reacted with little interest, although they seemed happy that he found another place to play, even if it meant he’d signed with a division rival. 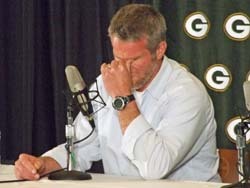 Some believed Favre’s motivation was sticking it to the Packers, which Favre denied at his news conference yesterday. Tell me this wasn’t a move that was set up weeks ago. When Brett Favre originally said he was done with football, he really meant he didn’t want to go through an entire training camp. Brad Childress said that’s it. The Vikings are moving on with Sage Rosenfels and Tarvaris Jackson. That didn’t last long did it? It’s funny that Favre signed and reported and all of a sudden the Vikings were selling all these purple Brett Favre #4 jerseys. And now, just like that, he’ll step right in and play in the Vikings second preseason game. It’s certainly going to make for an interesting season. The Packers and Vikings will hook up twice during the regular season, Monday, Oct. 5 at Minnesota and Sunday, Nov. 1 against the Vikings in Green Bay. Favre’s signing has certainly added some drama to those two games, not to mention raising the price of a ticket. It’s a shot in the arm for the NFL. First Michael Vick and now Brett Favre. I Can’t wait! Can Favre stay healthy? Will he throw for more touchdowns than interceptions? How massive will the boo’s be when Favre steps on Lambeau Field with a Vikings #4 jersey? The Vikings think they have a Super Bowl team with Favre and they’re going to have to go through the Packers to get there. Packers wide receiver Donald Driver was asked if this whole thing is a circus. He said it may be a circus, but it’s the Vikings circus, not the Packers.